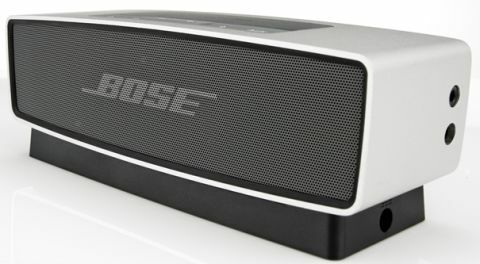 Bose SoundLink Mini review | What Hi-Fi? The Bose SoundLink Mini put a smile on our faces when we heard the lashings of deep, rich bass coming out of such a tiny wireless speaker. Compact speakers of this kind and price don’t tend to dig deep into the lower frequencies. Too often we’ve heard such speakers sound too thin and bright, simply because of a lack of bass depth. But Bose has managed it admirably. The SoundLink Mini’s bass performance is deep and inviting. More importantly, it underpins the overall sound with a sense of weight that’s lovely to hear. The Bose speaker envelopes you in a warm, meaty performance – we’re really impressed with the amount of depth it’s managed to pack in. Stream any song over Bluetooth, and they all sound satisfyingly solid. It’s a dynamic sound, too, with plenty of punch to the thumping beats. The rest of the frequency range hasn’t been ignored, either. Voices are rich and full of detail. The treble is smooth and gentle, and there’s no hint of brightness or sharpness to be heard – not even at higher volumes. It makes a welcome change from the wince-inducing harshness of rival speakers, but if we're being picky we’d like just a little more sparkle and bite. That said, the strength of that bass performance shouldn't be underestimated – it's head and shoulders above most rival speakers we've tested at this price, even if its lower frequencies can occasionally overwhelm other elements. Play Nine Inch Nails’ Where Is Everybody? from Spotify, and the twang of strings and synthesisers could do with a little more clarity. But that's a minor gripe. Bose has taken a 'no-frills' approach with the SoundLink Mini. There seems to be a ‘no frills’ policy: no NFC, no aptX streaming, no built-in mic for hands-free calls, and no smart app. So what does the SoundLink Mini have? Just simple Bluetooth for wireless streaming and a 3.5mm input for wired connection. Let’s keep this about the music, Bose seems to say. You also get a charging cradle. It’s a nice addition, the speaker slots in neatly, it can double as a stand and you can plug the mains charger into either the cradle or the speaker for charging. We’re a bit disappointed to see that it lasts a mere seven hours on battery power alone, though. Pick up the Bose and the first thing you’ll notice is how heavy it is. It’s surprisingly hefty, especially for such a small thing. It’s extremely sturdy and solid, and the weighty metal casing only adds to its premium quality feel. It certainly feels worth every penny of the £170 you pay for it, even if the design looks slightly dated next to the cooler, bolder designs of some newer models. But it’s a good size, and a decent portable option – as long as you don’t mind the weight. The grey rubber buttons on top are functional and respond well. There’s a button each for Bluetooth and auxiliary input, so it’s easy to switch between wireless and wired streaming. The silver aluminium casing is the only finish option, but Bose gives you the choice of adding on clear plastic covers with blue, green or orange highlights. We prefer the clean, untarnished look of the steely aluminium. Given the choice between a thin, sharp sound lacking in solid bass versus heaps of rich, deep bass and punchy sound, we’d go for the latter – especially in the case of this Bose speaker. It might not have all the features of some rivals, but its bass depth, build quality and confident delivery make the SoundLink Mini an outstanding contender at this price.